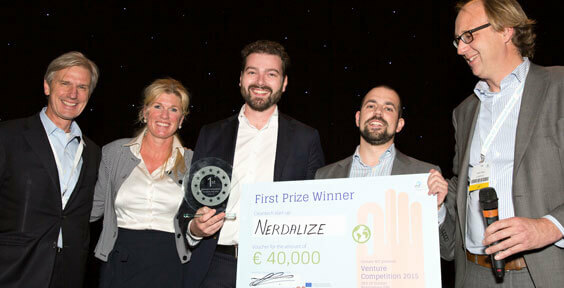 BIRMINGHAM, UK – Climate-KIC has announced cleantech start-up Nerdalize from the Netherlands as the winner of the European finals of the Venture Competition 2015 last night in Birmingham (UK). Nerdalize was awarded the title of Europe’s best climate venture and €40,000 to help take their climate venture, which is about heating buildings with computing power, to the next level. The Venture Competition is hosted by Climate-KIC, the EU’s main climate innovation initiative. Competitors at the event are drawn from Climate-KIC’s Accelerator programme, which identifies and nurtures cleantech entrepreneurs with a primary focus on solving climate change from idea to start-up. The most promising 23 participants of the Accelerator from across Europe were selected for the European semi-finals. The best eight teams progressed to the final with cash awards for the three best teams: 1st – €40,000, 2nd – €20,000, 3rd – €5,000; the third prize being an audience award. During the European final the eight finalists pitched to a renowned jury that judged the entrepreneurs on real-world criteria including feasibility, scalability, job creation and climate impact. The Venture Competition is part of Climate-KIC’s Journey to Paris for COP21, with these start-ups from Climate-KIC’s Accelerator providing proof that there are many profitable possibilities for building a zero carbon economy and climate resilient society. The next generation of cleantech start-ups is giving a clear message to the COP21 negotiations in Paris: We can have a planet with an abundance of cheap, clean industry and consumption within 20 years, provided that start-ups that are developing scalable, disruptive clean technologies are supported. Cleantech is the single biggest business opportunity of the 21st century. The organisation has its headquarters in London, UK, and leverages national and regional centres across Europe to educate students and professionals, to support start-up companies and to bring together partners on innovation projects to bring about a connected, creative transformation of knowledge and ideas into products and services that help mitigate and adapt to climate change.